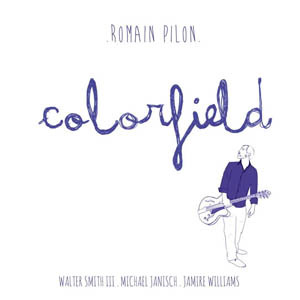 FRENCH GUITARIST Romain Pilon presents pretty much a blank, white canvas for the cover of his new release on Whirlwind Records – which seems entirely appropriate, given the title ‘Colorfield’. For, just as the distinctive art movement of the same name saw the likes of Rothko and Gottlieb creating enveloping expanses of bright, abstract, overlapping colour, so too gleams Pilon’s impeccably-formed quartet with Walter Smith III (tenor sax), Michael Janisch (bass) and Jamire Williams (drums). Since graduating from Berklee College, the past ten years or so of Romain Pilon’s rising career have seen him working with top flight musicians in New York and Paris, and is currently a member of the Paris Jazz Underground collective (along with David Prez, Olivier Zanot, Sandro Zerafa, Yoni Zelnik and Karl Jannuska). Although a new name to me, this characterful album is sure to increase Pilon’s profile. Colorfield’s impressive sequence of seven originals (plus a sublimely rich tenor and guitar reading of Horace Silver’s ‘Lonely Woman’) displays a sense of carefully crafted chamber jazz – though the quartet can certainly ramp up the tempo, as heard in the bass- and guitar-driven groove of the title track. There is clarity and warmth both in Pilon’s writing and playing, his open and fluid guitar style allowing the band considerable latitude, typified by the measured, cerebral calmness of ‘Man on a Wire’. And, on the subject of balance… as the chordal player here, Romain Pilon demonstrates remarkable respect for the overall colour palette, as heard in mobile opener ‘Acceptance’. The animated ‘Twombly’ suggests the freedom of the American painter’s expressionism, Pilon’s deft, reaching solo work easily echoing the artist’s huge red swirls seen recently at the Tate Modern. Further evidence of the leader’s skilful soloing is to be found in ‘Three on Seven’, along with subtle, lush chords and the fast, fluttering bass and drums of Michael Janisch and Jamire Williams. Profoundly delicate – and maybe a love song – the melodic line of ‘You’ is shared by Walter Smith and Pilon who also allow space for Janisch’s bass to sing, both as soloist and support; and closing number ‘7th Hour’ scurries joyfully to the high rhythm maintained by Williams who is a brilliantly precise presence throughout this recording. Launched on 7 October 2013, and featuring in the first Whirlwind Festival (Kings Place, 10-12 October), this is an intelligent and engaging set from a quartet of players who clearly feel a great connection.